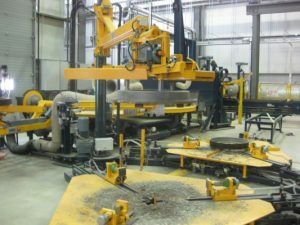 Besser Company offers completely automated pipe production systems to producers around the world. The automated handling system automatically places the pallet with a cage onto the machine loading station. A bi-rail moves the pipe to the moving floor, which transports it to the curing chamber. 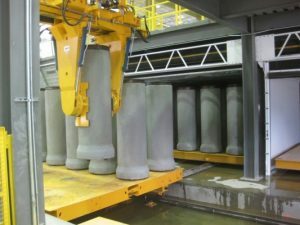 Once cured, the pipe is picked up by a robot and moved to a depalletizing station. 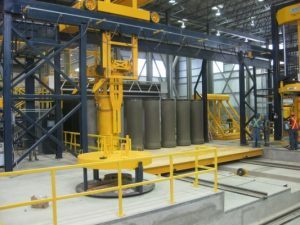 The pallet is then cleaned, stacked and oiled while the pipe is placed on the staging area, where it is deburred, measured for broadness and vacuum- or hydrostatic-tested. The pipe travels to the marketing station before being transported to the yard for storage. This product handling system can be installed in existing production facilities. The Besser line of concrete pipe making machinery includes both Advantage Series BiDi® concrete pipe machines and Besser vibration pipe machines. BiDi Advantage machines combine advanced pipe making technology with the time-tested Bidirectional Rollerhead System to produce pipe with excellent wire-to-concrete bond, improved compaction and superior appearance. BiDi Advantage machines are available in these models: the A-36 machine to produce concrete pipe diameters from 8″ – 36″ (200 mm – 900 mm) in maximum lengths of 8′ or 10′ (2.5 m or 3 m); the A-48 machine for diameters 8” – 48” ( 200 mm – 1200 mm) in maximum lengths of 8’ or 12‘ (2.5 m or 3.5 m); the A-60 machine for diameters from 12″ – 60″ (300 mm – 1500 mm) in maximum lengths of 8′ or 12′ (2.5 or 3.5 m); and the A-84 machine for diameters from 18″ – 84″ (450 mm – 2100 mm) in maximum lengths of 8′ or 12′ (2.5 m or 3.5 m).